• Dynalift, for immediate lifting and firming effect. • Energizing Night Cream: This Night Cream contains powerful Anti-Ageing ingredients with the unique ability to significantly decrease the depth of wrinkles, stimulate cutaneous vitality and energy and to firm the skin, reducing the signs of fatigue. • Firming Face Serum : This serum helps to decrease the appearance of wrinkles, pores, redness, dehydration, age spots and ineffective barrier functions. • Anti-Ageing Beauty Mask: A creamy, rinse-off facial Mask, formulated with the innovative PhytoCelltec technology, giving a younger and healthier look. To find out more about the ingredients and how these anti-ageing products work, download the brochure below. 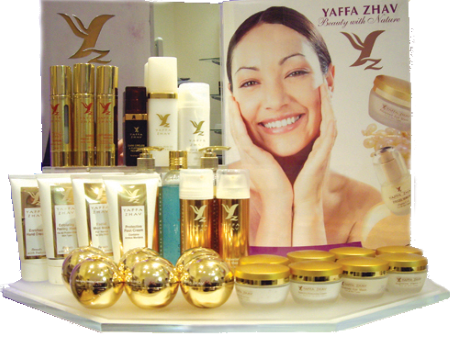 Yaffa Zhav is proud to present the revolutionary PhytoCellTec technology.